We love the PopSocket and this mount makes it so much better. Consider this the upgrade to the already popular PopSockets. The PopSockets Mount enables you to mount your phone to your dashboard, mirror, refrigerator, bed post, wall, or locker. Your PopSockets will snap easily into and out of your PopSockets Mount to enable hands-free viewing. 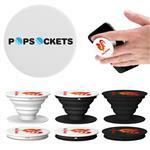 The PopSockets Mount attaches to surfaces with a single-use 3M VHB adhesive; it can be removed without leaving any residue with fishing line or dental floss. 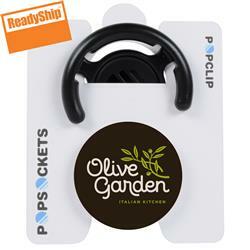 This is a great PopSocket upgrade and promotional auto item. FREE SHIPPING! Production Times Available: 5 working days standard up to 1000 pieces. Rush Available - Inquire. Typical Imprint Area(s): 1.53" diameter. 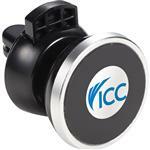 1.7" diameter with full bleed option. Sticks with rinsable, repositionable gel.